George Osborne just came out in favour of counter-cyclical policy — saving more in the boom, and spending more during a “rainy day”. This is consistent with John Maynard Keynes’ notion that “the time for austerity at the Treasury is the boom, not the slump”. He told the Conservative conference the public finances should be in the black when the economy was strong as insurance against a “rainy day”. The BBC News Channel’s chief political correspondent Norman Smith said Mr Osborne’s underlying message was that austerity would continue after the next election despite the return to growth. If 7.8% unemployment and a smaller real economy than 5 years ago doesn’t constitute a rainy day, I’d like to know what does. To me, and to many economists this kind of thing doesn’t just constitute a rainy day, it constitutes a full blown great depression. Eventually, sooner or later, someday the economy will return to growth and full employment. With the right luck — technology breakthroughs and other exogenous shocks etc — that could be two or five years from now. The experience of Japan, however, who have endured a 20 year depression suggests that it could be much later rather than sooner. The safer alternative is to use fiscal policy — as Osborne himself implies — during the rainy day to directly bring back full employment sooner, rather than later by engaging in infrastructure projects and the like. Even if a government hasn’t saved money during the boom, interest rates are so low during the slump that it is cheap to do so, even in the context of soaring national debt levels as is the case in Japan today. Getting the economy to a point where the government can run a budget surplus, of course, is still a noble ambition. 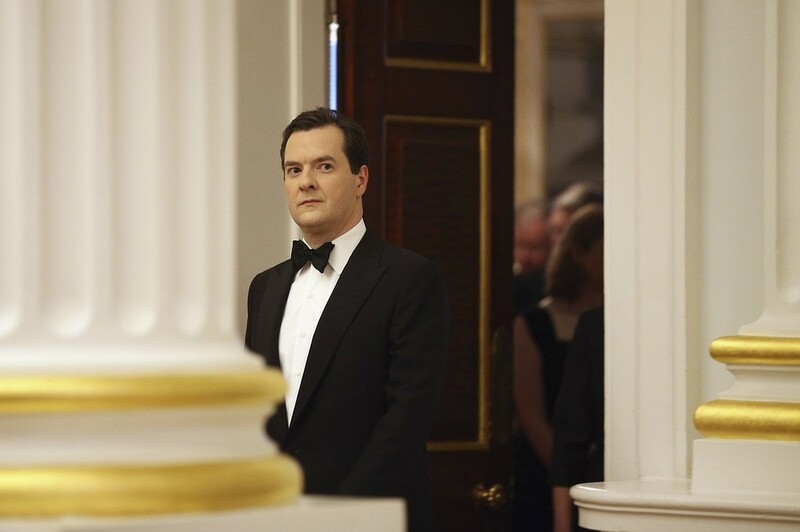 But Osborne has shown no awareness whatever of the steps that need to be taken to get to that position. Infrastructure and housing investment and a jobs program would be a start. So too would liberalising planning laws and lending to and deregulating business startups so that more houses can get built and more businesses can get started. For now, Osborne is preaching responsibility while doing something deeply irresponsible — prolonging a depression with unnecessary demand-sucking job-killing austerity. The boom, not the slump, is the time for austerity at the Treasury and this (for the love of God) is not the boom. That ultimately is the choice for Britain — either we can abandon our efforts to deal with our debt problems and make a difficult situation very much worse or we can redouble our efforts to overcome our debts and make sure this country can earn its way in the world. Osborne is tackling this from the wrong end of the problem. Strong, sustainable economic growth is the way to tackle the debt problem in the long run. But Osborne’s fiscal austerity is not the way to strong sustainable economic growth, which means he is failing by on his own terms and by his own definition. In terms of growth, since 2007 Britain has done worse than comparable countries. 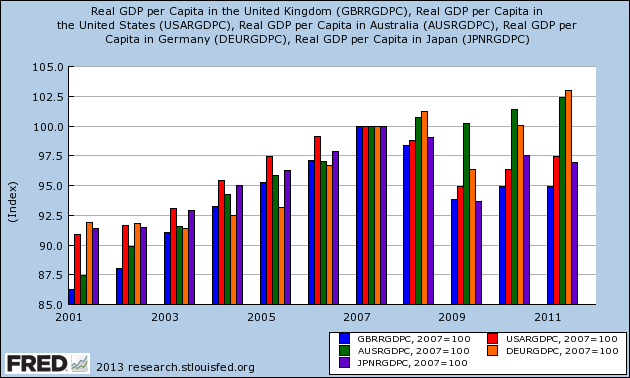 People like to talk of Japan’s problems with depressed growth, but since 2007 Britain has done worse than Japan. And this lack of growth is the real reason why Britain’s debt load becomes ever more unsustainable, no matter how much austerity Osborne tries to implement. So what’s Osborne’s plan to generate growth? Reduce regulation and taxes on small businesses and new businesses? Make it easier for construction companies to build new homes? Invest in infrastructure (ultra-fast broadband, improved roads and rail) and energy (solar, wind, hydroelectric, oil, natural gas)? Invest in science and basic research? Guarantee loans to unemployed people so they can become self-employed? Offer incentives to foreigners to invest in the UK? Cutting spending (and yes — in real terms George Osborne is cutting spending) and raising taxes isn’t cutting it. It’s constricting growth. And at the next election if this depression continues, people will vote in droves for anyone but Cameron and Osborne. 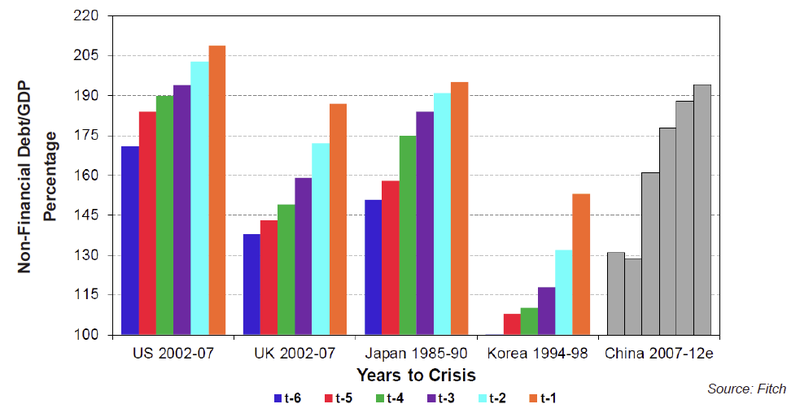 Will we see a Chinese financial meltdown in 2013? Or 2014? Or 2015? With global GDP growth on a definite trend downward, with such a tepid Western recovery, and with global geopolitical tensions still high, the last thing the global economy needs is a financial crisis at the heart of the BRIC growth engine. But the data implies that that may just be what we get. This is a post in three sections. First I want to outline my conception of the price level phenomena inflation and deflation. Second, I want to outline my conception of the specific inflationary case of hyperinflation. And third, I want to consider the predictive implications of this. What is inflation? There is a vast debate on the matter. Neoclassicists and Keynesians tend to define inflation as a rise in the general level of prices of goods and services in an economy over a period of time. Prices are reached by voluntary agreement between individuals engaged in exchange. Every transaction is unique, because the circumstance of each transaction is unique. Humans choose to engage in exchange based on the desire to fulfil their own subjective needs and wants. Each individual’s supply of, and demand for goods is different, and continuously changing based on their continuously varying circumstances. This means that the measured phenomena of price level changes are ripples on the pond of human needs and wants. Nonetheless price levels convey extremely significant information — the level at which individuals are prepared to exchange the goods in question. When price levels change, it conveys that the underlying economic fundamentals encoded in human action have changed. Economists today generally measure inflation in terms of price indices, consisting of the measured price of levels of various goods throughout the economy. Price indices are useful, but as I have demonstrated before they can often leave out important avenues like housing or equities. Any price index that does not take into account prices across the entire economy is not representing the fuller price structure. Austrians tend to define inflation as any growth in the money supply. This is a useful measure too, but money supply growth tells us about money supply growth; it does not relate that growth in money supply to underlying productivity (or indeed to price level, which is what price indices purport and often fail to do). Each transaction is two-way, meaning that two goods are exchanged. Money is merely one of two goods involved in a transaction. If the money supply increases, but the level of productivity (and thus, supply) increases faster than the money supply, this would place a downward pressure on prices. This effect is visible in many sectors today — for instance in housing where a glut in supply has kept prices lower than their pre-2008 peak, even in spite of huge money supply growth. So my definition of inflation is a little different to current schools. I define inflation (and deflation) as growth (or shrinkage) in the money supply disproportionate to the economy’s productivity. 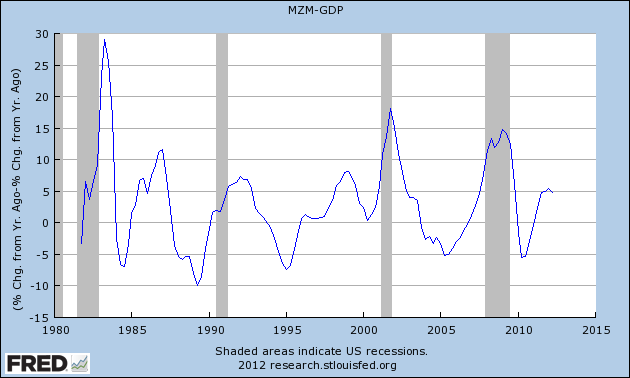 If money grows faster than productivity, there is inflation. 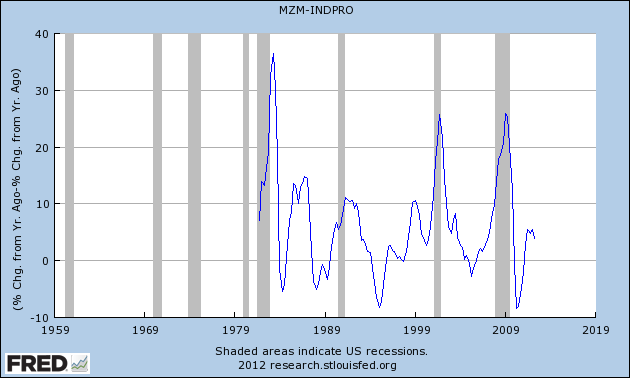 If productivity grows faster than money there is deflation. 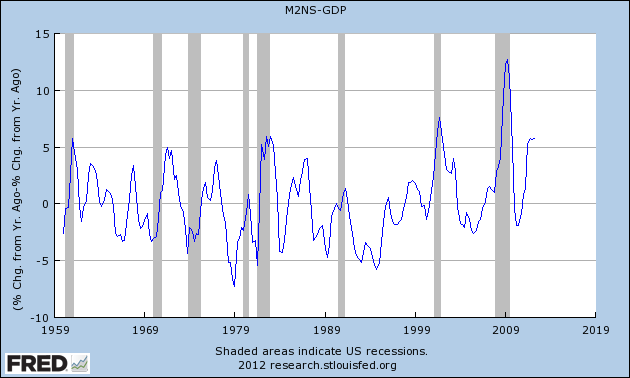 If money shrinks faster than productivity, there is deflation. 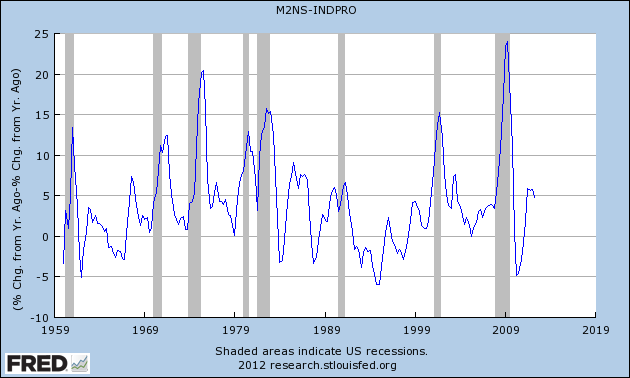 If productivity shrinks faster than money, there is inflation. Inflation and deflation are in my view a multivariate phenomenon with four variables: supply and demand for money, and supply and demand for other goods. This is an important distinction, because it means that I am rejecting Milton Friedman’s definition that inflation is always and only a monetary phenomenon. And additionally, changes in the money supply can lead to changes in productivity — and that is true even under a gold or silver standard where a new discovery of gold can lead to a mining-driven boom. MV=PQ is a four-variable equation, and using a four-variable equation to establish causal linear relationships between two variables is tenuous at best. Through the multivariate lens of relative inflation, we can grasp the underlying dynamics of hyperinflation more fully. I define hyperinflation as an increase in relative inflation of above 50% month-on-month. This can theoretically arise from either a dramatic fall in ΔQ or a dramatic rise in ΔM. This disparity between naturally-scarce gold which has never been hyperinflated and artificially-scarce fiat currencies which have been hyperinflated multiple times suggests very strongly that the hyperinflation is a function of governments running printing presses. Of course, no government is in the business of intentionally destroying its own credibility. So why would a government end up running the printing presses (ΔM) to oblivion? 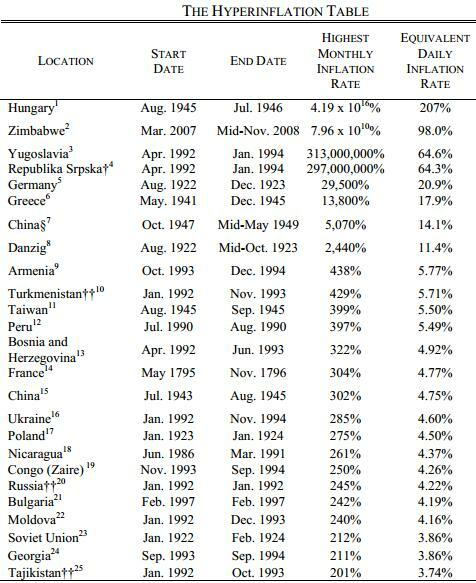 Well, the majority of these hyperinflationary episodes were associated with the end of World War II or the breakup of the Soviet Union. Every single case in the list was a time of severe physical shocks, where countries were not producing enough food, or where manufacturing and energy generation were shut down out of political and social turmoil, or where countries were denied access to import markets as in the present Iranian hyperinflation. Increases in money supply occurred without a corresponding increase in productivity — leading to astronomical relative inflation as productivity fell off a cliff, and the money supply simultaneously soared. Hyperinflation is an economic malady that arises under extreme conditions: war, political mismanagement, and the transition from a command to market-based economy—to name a few. So in many cases, the reason may be political expediency. 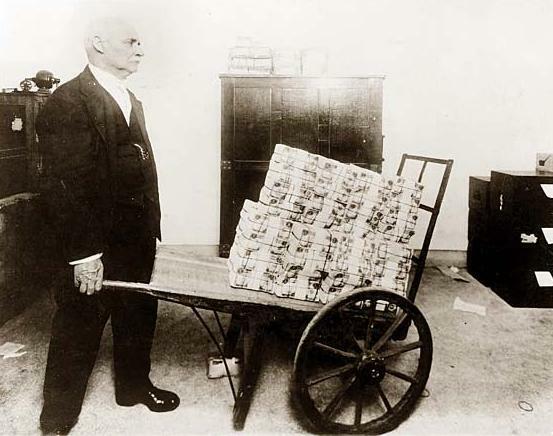 It may seem easier to pay workers, and lenders, and clients of the welfare state in heavily devalued currency than it would be to default on such liabilities — as was the case in the Weimar Republic. Declining to engage in money printing does not make the underlying problems — like a collapse of agriculture, or the loss of a war, or a natural disaster — disappear, so avoiding hyperinflation may be no panacea. 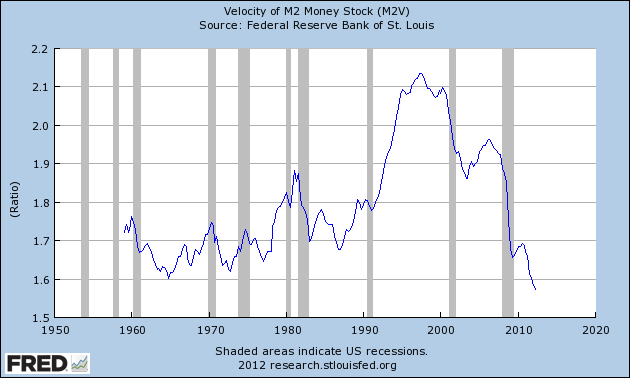 Money printing may be a last roll of the dice, the last failed attempt at stabilising a fundamentally rotten situation. The fact that naturally scarce currencies like gold do not hyperinflate — even in times of extreme economic stress — suggests that the underlying mechanism here is of an extreme exogenous event causing a severe drop in productivity. Governments then run the printing presses attempting to smooth over such problems — for instance in the Weimar Republic when workers in the occupied Ruhr region went on a general strike and the Weimar government continued to print money in order to pay them. While hyperinflation can in theory arise either out of either ΔQ or ΔM, government has no reason to inject a hyper-inflationary volume of money into an economy that still has access to global exports, that still produces sufficient levels of energy and agriculture to support its population, and that still has a functional infrastructure. This means that the indicators for imminent hyperinflation are not economic so much as they are geopolitical — wars, trade breakdowns, energy crises, socio-political collapse, collapse in production, collapse in agriculture. While all such catastrophes have preexisting economic causes, a bad economic situation will not deteriorate into full-collapse and hyperinflation without a severe intervening physical breakdown. Hyperinflation is notoriously difficult to predict, because physical breakdowns like an invasion, or the breakup of a currency union, or a trade breakdown are political in nature, and human action is anything but timely or predictable. Rising Public and-or Private Debt — risks currency crisis, especially if denominated in foreign currency. Import Dependency — supplies can be cut off, leading to bottlenecks and shortages. Energy Dependency — supplies can be cut off, leading to transport and power issues. Fragile Transport Infrastructure — transport can be disrupted by war, terrorism, shortages or natural disasters. Overstretched Military — high cost, harder to respond to unexpected disasters. Natural Disaster-Prone — e.g. volcanoes, hurricanes, tornadoes, drought, floods. Civil Disorder— may cause severe civil and economic disruption. Readers are free to speculate as to which nation is currently most fragile to hyperinflation. However none of these factors alone or together — however severe — are guaranteed to precipitate a shock that leads to the collapse of production or imports. But if an incident or series of incidents leads to a severe and prolonged drop in productivity, and so long as government accelerates the printing of money to paper over the cracks, hyperinflation is a mathematical inevitability. It seems only a few days ago that I was explaining why China was not going to save the PIGS’ bacon — if they want to invest in Europe they can wait until the situation severely deteriorates to get more bang for their buck. Perhaps the most important cause of our economic malaise is that for years as a nation we have been living beyond our means, in deficit with the rest of the world, buying from other countries far more than we produce, till our indebtedness became unsustainable. By contrast China has been consuming far less than it produces, accumulating vast surpluses. So as we work down our debts, the hope of the government has been that the Chinese could be persuaded to invest some of their vast surpluses in our infrastructure, in a way that would ease the pain of our economic slowdown and would yield a decent return to China over the long term. That’s why the Chancellor of the Exchequer was today so delighted that China’s sovereign wealth fund, China Investment Corporation, which controls more than £250bn – has bought a stake of almost 9 per cent in London’s water and sewage business, Thames Water. Britain has been happily munching on that Chinese-manufactured free lunch of consumer goods and cheap labour, but now she wants to enjoy the benefits of China’s years of thrift and productivity by having China pay for infrastructural improvements. The first thing to note is that selling equity seems much better than selling debt. A lot of Chinese resentment toward America stems from America’s protectionist attitude to its economy — America won’t let China freely acquire equities with their surplus dollars. Debt — especially debt that gets paid with newly-printed money — creates a relationship of mutual antagonism. Creditors and debtors have a history of trying to screw one another. Equity — i.e., Chinese ownership — gives more of a shared incentive for success. The second thing to note is that China may still be reluctant to invest now. With Britain holding a huge debt bomb — and looking at a future of excruciating deleveraging — it seems pretty likely that China will be able to get more bang for their buck in the near future than they can now. Thirdly, as a result of the Opium Wars, the governing class in China hold a grudge against Britain. A shared future — with China as an investor in Britain — would undoubtedly go a long way to heal some wounds. While America and the West have shifted their economies toward endless consumerism, tourism and globalisation China has been busy building herself into the greatest industrial powerhouse in world history. Infrastructure undoubtedly plays a huge role in that. So it largely seems like a good idea. 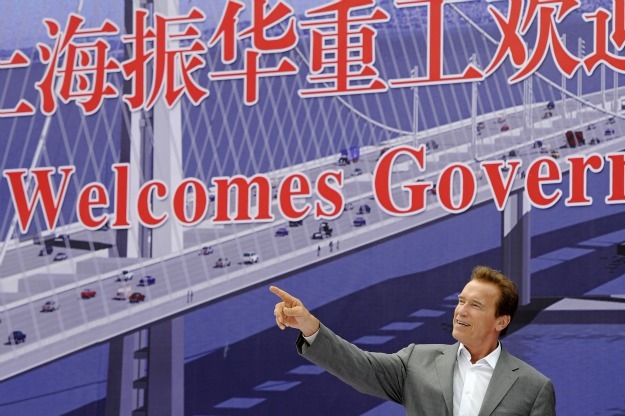 But there’s still a long way to go before we can truly say China is an investor in Britain. Until then, Britain needs to be the leading investor in British infrastructure. Free market disciples are understandably incensed that governments around the world are sending thousands of bureaucrats around the world on junkets (Copenhagen, Durban, etc) to negotiate a framework between governments to impose emissions limitations to solve an issue (manmade climate change) that may or may not cause huge economic, social and geopolitical problems in the future. Countries agreed to a deal today to push for a new climate treaty, which will cut emissions in poorer countries, costing British taxpayers £6billion. 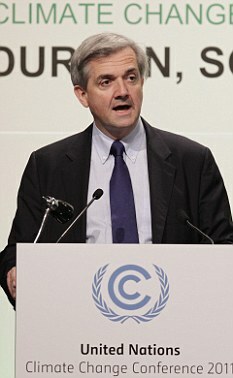 Energy Secretary Chris Huhne hailed the £64billion deal as a ‘significant step forward’ which would deliver a global, overarching legal agreement to cut emissions. But environmental groups said negotiators had failed to show the ambition necessary to cut emissions by levels that would limit global temperature rises to no more than 2C and avoid ‘dangerous’ climate change. I don’t really have any problem with the idea that a highly active and productive species like human beings can heavily influence our climate. In fact, I think there is a good deal of circumstantial evidence to suggest that we have been doing it for millennia.Over thousands of years a small uptick in greenhouse gases (from agriculture) has warmed the Earth, staving off new glaciation and thereby creating conditions beneficial to the development of modern civilisation. So my real problem is with the view that somehow humanity can accurately predict future climactic trends via simulations and models. The idea that economies are simply too complex to accurately model applies even more to climates, which are vastly more complicated systems. While we can’t reliably predict what the precise results of this will be, keeping global greenhouse gas levels close to the pre-industrial ones seems to be a good insurance policy. Imposing emissions limitations using carbon credits which can then be traded on exchanges is no such thing. Why? It does not address atmospheric greenhouse gas levels; it merely affects emissions. Stabilising greenhouse gas levels requires removing gases from the atmosphere, either through traditional means like planting new forests, or through exotic technologies like carbon-scrubbing. It creates systemic financial fragility; imposing an artificial cap on emissions in an economy which is still heavily-carbon based will in all-likelihood lead to some form of carbon derivatives bubble. A widespread transition to alternative energy — supposedly, what is to be encouraged — would reduce the value of carbon credits, which would mean big losses for speculators. It is entirely plausible that this could lead to bank failures. Essentially, the bureaucrats at Durban are wasting their time and taxpayers’ money. Eventually, as the global economic situation worsens, governments will cotton on to the fact that a quick and easy way to create new growth is through spending money on developing renewable energy infrastructure, and the removal of carbon dioxide from the atmosphere through traditional means (planting trees), and non-traditional ones (carbon scrubbing). Unemployed people will be put to work on such schemes. While this is not particularly sound economics it is significantly better ecologically than the current proposals, because it actually concentrates on the issue at hand (atmospheric CO2) rather than producing a bureaucratic framework that nations can (and will) just flout. Ideally, we would have a free market where such technologies and systems can organically develop based on economic utility. In reality, we have a global energy market rigged by US military largesse — oil is the global standard, and America spends trillions to keep it cheap and plentiful. Alternative energy cannot compete with a petrodollar hegemon. Usually, government money is problematic because it misallocates capital. Very occasionally it does something really worthwhile, and anything that works toward getting America off its oil addiction has the potential to be worthwhile. NASA is another example of successful government spending — every dollar invested in the Apollo program yielded $23 of benefit to the wider economy°. Whatever happens, I’m fairly certain that the meetings, the treaties, and the desperate scrabble for “consensus” won’t be responsible for anything other than wasted time and money. 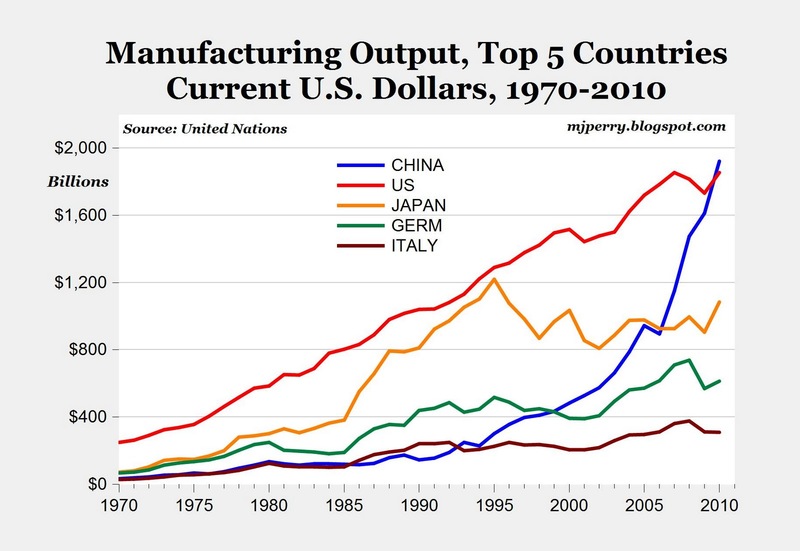 Just how dependent is America on Chinese labour, manufacturing and supply chains? Decide for yourself. San Francisco is getting a new bridge connecting to Oakland. But it’s not being built by American workers. It’s being built in China and shipped back to America for assembly. But that’s not the only infrastructure project being built by the Chinese, and it’s not just being built in China. It turns out, the state-owned Chinese contractors are being hired out to build American infrastructure right here in the United States. According to Engineering News Record, five of the world’s top 10 contractors, in terms of revenue, are now Chinese. 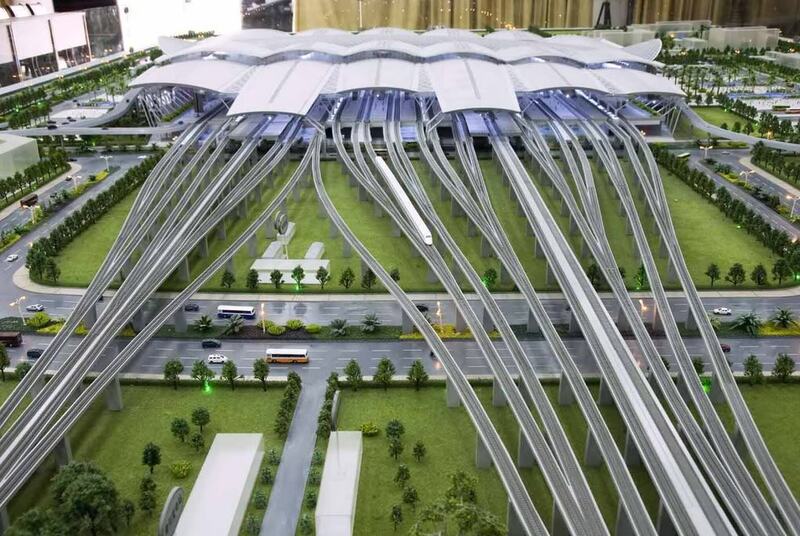 One of them, China State Construction Engineering Group, has overtaken established American giants like Bechtel. The Chinese contractor has already built seven schools in the US, apartment blocks in Washington DC and New York and is in the middle of building a 4,000-room casino in Atlantic City. In New York, it has won contracts to renovate the subway system, build a new metro platform near Yankee stadium, and refurbish the Alexander Hamilton Bridge over the Harlem river. But why are we hiring contractors from China to build American infrastructure, when we have a perfectly good workforce here in the states? The answer is profit, and it’s the reason why Republican politicians and many corporations do not support infrastructure projects that would put millions of Americans to work. Because the Chinese contracting firms are government owned, they are able to bid for contracts at very low prices. In other words, the labor is cheap. American companies don’t want to hire Americans to do the work when they can call up Communist China to come do the work instead.